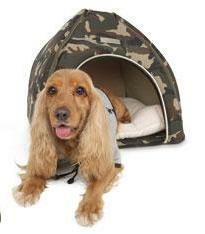 Your brave little soldier will love sleeping in his Puppy Angel Military Camp House. Made from four padded camo panels the inner cushion is beige coloured with the words Puppy Angel embroidered on it. The entrance is trimmed in gold piping and the entire bed can be folded flat for storage or travel using the zips on all four corners. (19.5" x 19.5" x 19.5") and matches the Miss Skull Pet-Sling Carrier in Camo.